Season your new cookie stamps before using them the first time by brushing them with cooking oil. A toothbrush is ideal for this. The stamp becomes seasoned after using a few times and seldom needs further treatment. The stamp works best if the ball of dough is stamped immediately after rolling it in sugar. If a stamp begins to stick, brush off particles of dough and let stamp rest. The stamp dries and will stamp well again. When finished stamping your cookies, clean the face of your stamps with hot water and a soft brush to remove all traces of butter. Your cookie stamps may be hand-washed like any dish. Let them dry and store in a sealed container. If your recipe calls for creaming the butter and sugar, be sure not to overcream, as this may introduce excess air into the batter which can cause the imprinted design to “melt away” somewhat during baking. High-speed mixers may cream too fast – try turning it to the slowest speed or else cream by hand. 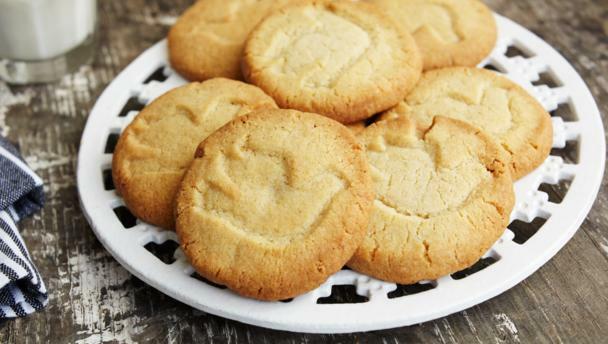 Experiment with your own butter cookie recipes. You may want to avoid any leavening agent, which means recipes that contain eggs, baking powder or baking soda, as the design tends to disappear when the cookie rises. You may also want to experiment with the type and brand of flour you use, as flours vary by type and brand and may affect the dough’s texture and ability to hold the stamp designs. If the design stamps well but disappears when baked, add a little more flour to the dough. You may find you prefer to use more flour than is called for in our recipes. You may also find that bread flour holds the designs better because it has more gluten. You may also add gluten (found in the grocery store) to your recipe to give more body to the dough and hold the design during baking. Dough tinted with food coloring often makes the design more distinct. Lightly beaten egg white may also be tinted with food coloring and painted on the cookie with a brush immediately after the cookies come out of the oven. To paint your cookies after they are cooled, try mixing food coloring with water and powdered (confectioners) sugar, then painting with a paintbrush. You can also melt your favorite chocolate in the top of a double boiler (over boiling water to melt it slowly without burning it), and use a paintbrush to apply it to the design like paint. Be sure to use “homogenized” peanut butter rather than the natural types that separate in the jar (the oil rises to the top and it has to be stirred). ...if cookies are too brown on the outside and not done on the inside, lower your oven temperature and increase the baking time. ...thin cookies bake quicker than thick cookies; adjust baking temperature and time accordingly. ...when using more than one cookie sheet, rotate the sheets on the oven racks half way through the baking cycle. *This is by far our customers' all-time favorite recipe. More recipes we think you'll enjoy!